Today’s leg of the A2B Journey was an uneventful run through the Ivanpah Valley on the north side of the Mojave National Preserve. There is one interesting thing that I have wanted to share should you ever find yourself at the preserve. It is about how a group of scientists are leveraging mobile apps to assist in their research. 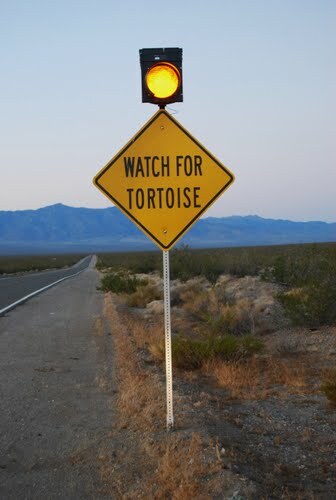 Visitors to the preserve can download the Mojave Desert Tortoise App to their iPhone or Android device. 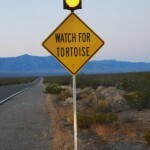 Park guests are encouraged use the app to take photos of desert tortoises as they come across them in the Mojave Desert. The app adds GPS data to the photo and sends it to researchers at the Mojave Desert Ecosystem Program. This information is then used to track the tortoises’ movement and habits. Likewise, it will help researchers preserve this threatened species. I did a short run yesterday. So, I needed to do a longer run today. However, I had an earlier than normal work meeting. As a result, my choices were to get up earlier or to run faster. Of course, the ideal solution is sleep more, run fast! Believing in the soundness of that approach, I decided to give it a shot. I patiently went through my normal morning routine of stretching and drinking water. But I was very eager and excited to get a fast run in. So, I quickly grabbed my watch, water, and iPod, then headed out. With good music to help drive the pace I needed, I got off to a great start! When I reached the 2 mile mark, I checked my watch to see how I was progressing. I was surprised when my stopwatch showed me a time of 00:00.00. I just laughed! I had forgotten to start my stopwatch. I have no idea how well I did on today’s run. I DO know that it was fun and productive! And I made it to my meeting on time! I thought about these changes a lot during my run. If I allowed it, I would get overwhelmed. But, I have little time for that. So, I began anticipating the impacts and outcomes. I realize that I have limited control over the initial impacts. But, I have absolute control over the outcomes. Successfully working through new challenges requires time and effort. I can do effort. So, time is the initial issue. How will the time needed to work on new “opportunities” affect time needed for current commitments? As I finish my run, I am happy because I now have a better, more appropriate mindset as I press forward.